The future of personalized medicine comprise quantifiable diagnosis and tailored treatments; i.e. delivering the right treatment at the right time. To achieve standardized definition of what “right” means, the designated treatment location and lesion size are important factors. This is unrelated to whether the treatment is focused to a location or general. The role of medical imaging is and will continue to be vital in that respect: Patients’ stratification based on imaging biomarkers can help identify individuals suited for preventive intervention and can improve disease staging. 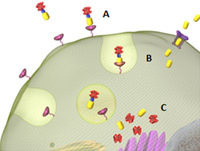 In vivo visualization of loco-regional physiological, biochemical and biological processes using molecular imaging can detect diseases in pre-symptomatic phases or facilitate individualized drug delivery. Furthermore, as mentioned in most of my previous posts, imaging is essential to patient-tailored therapy planning, therapy monitoring, quantification of response-to-treatment and follow-up disease progression. Especially with the rise of companion diagnostics/theranostics (therapeutics & diagnostics), imaging and treatment will have to be synchronized in real-time to achieve the best control/guidance of the treatment. It is worthwhile noting that the new RECIST 1.1 criteria (used in oncological therapy monitoring) have been expanded to include the use of PET (in addition to lymph-node evaluation). In this post I would like to highlight the potential contribution of medical imaging to development of companion diagnostics. I do that through the story on co-development of Vintafolide (EC145) and etarfolatide (Endocyte/Merck). 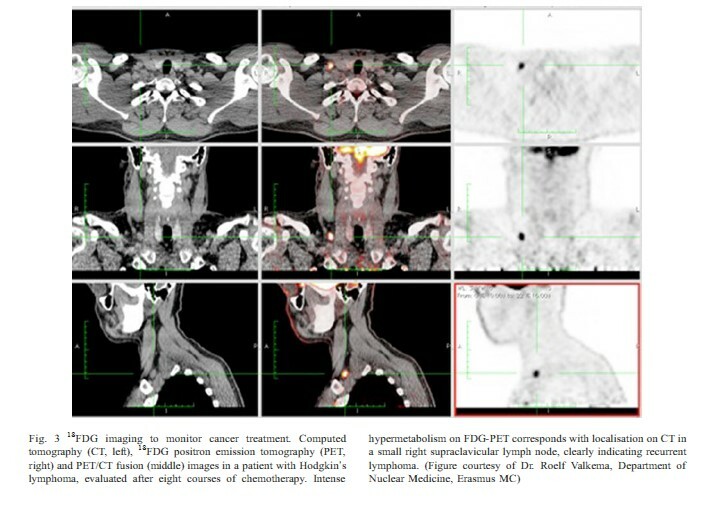 Etarfolatide is a folate-targeted molecular radiodiagnostic imaging agent that identifies tumors that overexpress the folate receptor. The folate receptor, a glycosylphosphatidylinositol anchored cell surface receptor, is overexpressed on the vast majority of cancer tissues, while its expression is limited in healthy tissues and organs. Folate receptors are highly expressed in epithelial, ovarian, cervical, breast, lung, kidney, colorectal, and brain tumors. When expressed in normal tissue, folate receptors are restricted to the lungs, kidneys, placenta, and choroid plexus. In these tissues, the receptors are limited to the apical surface of polarized epithelia. Folate, also known as pteroylglutamate, is a non-immunogenic water-soluble B vitamin that is critical to DNA synthesis, methylation, and repair (folate is used to synthesize thymine). Vintafolide (EC145) delivers a very potent vinca chemotherapy directly to cancer cells by targeting the folate receptor expressed on cancer cells. Approximately 80-90 percent of ovarian and lung cancers express the receptor, as do many other types of cancer. 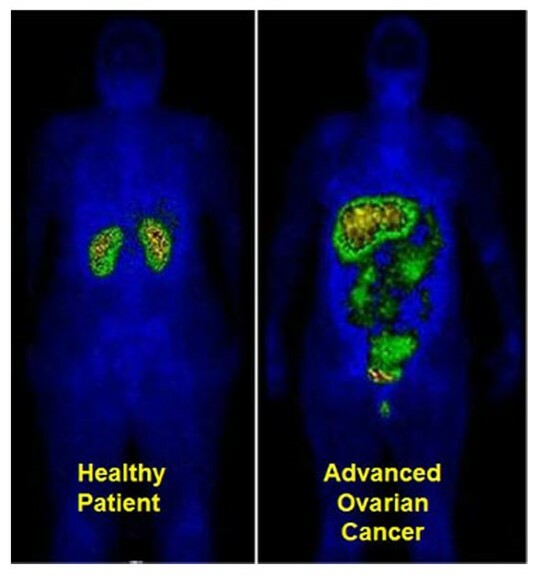 Clinical data have shown that patients with metastases that are all positive for the folate receptor, identified by etarfolatide, benefited the most from the treatment with vintafolide, the corresponding folate-targeted small molecule drug conjugate. Having both drug and imaging agent rely on folate receptors within the patients body Endocyte’s strategy was to develop the imaging agent and to use it to accelerate R&D and regulation. Endocyte and Merck entered into a partnership for vintafolide in April 2012. Under this partnership Merck was granted an exclusive license to develop, manufacture and commercialize vintafolide. Endocyte is responsible for conducting the PROCEED Phase 3 clinical study in women with platinum resistant ovarian cancer and the Phase 2b second line NSCLC (non-small cell lung cancer) study named TARGET. Merck is responsible for further clinical studies in additional indications. This Co-development of a diagnostic and therapeutic agent, was conducted according to the FDA guidance on personalized medicine and resulted with vintafolide gaining, already in 2012, status of orphan drug in EMA. The following is an extract from a post by Phillip H. Kuo, MD, PhD, associate professor of medical imaging, medicine, and biomedical engineering; section chief of nuclear medicine; and director of PET/CT at the University of Arizona Cancer Center. I think that those of you who reached this point in my post deserve a special bonus! So here it is: A medical-imaging initiative that is as ambitious and complex as the initiative to send humans into deep-space. This is the The European Population Imaging Infrastructure initiative of the Dutch Federation of University Medical Centres (NFU) and the Erasmus University Medical Centre Rotterdam, Department of Radiology, chaired by Professor Gabriel P. Krestin. The NFU has made available initial funding for the development of this initiative. The European Population Imaging Infrastructure closely cooperates with the European Biomedical Imaging Infrastructure Project EURO-BioImaging which is currently being developed. The ultimate aim of the infrastructure is to help the development and implementation of strategies to prevent or effectively treat disease. It supports imaging in large, prospective epidemiological studies on the population level. Image specific markers of pre-symptomatic diseases can be used to investigate causes of pathological alterations and for the early identification of people at risk. More information on this infrastructure and on the role of the European Population Imaging Infrastructure in this can be found in the Netherlands Roadmap for Large-Scale Research Facilities, the applicaton for funding of the Roadmap Large Scale Research Facilities Application form of the Roadmap EuroBioImaging, and on the Euro-BioImaging website. Certainly, while making progress with this initiative, many lessons will be learned. I recommend to explore this site and Enjoy! This is very interesting. Brain tumors are most often metastatic, except for primary tumors such as, glioblastoma 1-4, meningeoma. Meningeoma is not very aggressive, and glioblastoma 1 is in no way comparable to glioblastoma mutilforme. Pituitary tumors associated with virilization and those with HGH are innocuous. I have thyroid cancer, soon to be removed, which has 98% 10 year survival. The surgeon tells me that endocine tumors are so to say – lightweight. I don’t know, but I think that there is an association with the balance of NAD/NADP and primary engagement in syntheses. My son-in-law notes that even though the liver synthesizes the transport proteins and lipids, and stoes glycogen, it is the major organ of detoxification. I think that in those circumstances the folate receptor target woul be more ineffective. Great discussion, thank you p, both. Thanks. I asked about just removing the centrally located malignant nodule. I also thought about contacting you. I’ve had too many Dr. visits. They did do removal of a nodule and later had a recurrence. I had two hypo-echoic areas with no margin on the right that weren’t biopsied. My son-in-law says they were likely fluid filled cysts. The malignant lesion had calcification. When it was biopsied, I asked the radiologist if it was related to calcium calmodulin kinase, and he said he wasn’t familiar with that. The left lobe is unaffected. Your idea is actually a good one. I’m even surprised that they would relie on US for the biopsy. They also used US for the lymph nodes (biopsy negative). If the one node of thyroid were functional, then it was be unnecessary to take Synthroid. You are doing the imaging at 3-d, which is superior. My first cousin has gone 15 years after surgery and medication for acromegaly from a pituitary tumor. The adrenal cortical tumors are also innocuous. They found paralysis of the right vocal cord, and tumor is too far from the recurrent laryngeal nerve, so they cancelled the Jan 10 surgery for a neurology appt to check on myasthenia gravis (as son-in-law predicted)(he’s a brilliant neurologist). So I go to surgery on Feb 12. My loss of voice has been slow and preceded the thyroid by maybe 2 years, and the TSH below 0.01 was normal 9 months earlier. My surgeon friend from New York said that the could place a support into the right vocal cord, like Julie Andrews to repair the voice problem. Please cut this comment and E-MAIL it directly to Dr, Nir. I hadn’t checked to see how common it is. It is common. Do you have any idea why there was no interest? Maybe they did not see an ROI on what they already had? Here is a case where crowdfunding or Aviva’s contact in Israel woul have ideas. I enjoyed reading this article and I found it relevant to be included in two forthcoming volumes on Cardiovascular Diseases. 2. In our CVD 1,2,3 – Volume Two and/or Volume Three will benefit from having this article included. Respectively, I will e-mail the URL of your article to the Editors of 1 and 2, above with my recommendation for article inclusion. I’ll report the article ID in each volume after Editor placement of the article in the Volumes. Thank you for the motivational writing style as well. If it is a private matter under HIPPA, it is of no concern to me in any legal sense. This is not my medical record, and my laboratory results, biopsies, medications are not herein contained. It is a very relevant discussion, even more so with the within the week publication of a major publication on the organ specific characteristics of human cancers, which brought me back to NO Kaplan’s Harvey Lecture given at Harvard in 1972, related to his discovery of the pyridine nucleotide transhydrogenases in the laboratory of Nobelist Fritz Lippmann (for Coenzyme A)(with the participation of Colowick and Kaplan, who later Co-Edited Methods in Enzymology: the most successful publication in the history of Academic Press). I had a discussion yesterday with my Yale Endocrinologist about the, at least to me, limitation of ECHO. You only see echogenicity, and the biopsy depends on the feature of non echogenic alone, possiblly with a sprinkle of calcification that is spotty echogenicity in nonechogenic lesion. You may chorrect me if I am wrong. She was very impressed with what you have done, and hoped it would be used for thyroid. Returning to the issue of variation in tumor expression, I point out that hormonal organs are biosynthetic functionally, so they have an outsized dependence on what Warburg termed triphosphopyridine nucleotides (TPN, TPNH/ or nicotinamide adenine trinucleotides – NADP/NBADPH) over the diphosphopyridine nucleotides (DPN/DPNH or nicotinamide adenine dinucleotides – NAD/NADH). I know of no other work pursuing that line of thinking, especially in cancers. Hepatomas are very aggressive, and they carry out lipid and protein synthesis, but also carry out major detoxification. I don’t know where the far less common sarcomas belong, except for those of bone. I know that bone growth is at the metaphysis, and that is where you have the formation and removal of bone that peaks at age in mid 20s, with the removal of 100 microns of bone by 1 osteoclest and the refill of 1 micron a day per osteoblast – called remodelling, which becomes deranged with Paget’s disease of bone (resulting in pumice bone). The characteristic tumors occurring at a young or early middle age are giant cell tumors that resorb bone (B/M), parathyroid driven osteitis fibrosa cystica (B), osteosarcoma (intraoseous, M; parosteal, M and slow growing, osteochondroma and chondrosarcoma (slow growing). The expression is related to the relationship to muscle pull, and to electrical fields that exist in bone structure (and bone healing is also affected by application of an electromagnetic field). At this point I want to dwell on the folate discussion…. Folate receptors are highly expressed in epithelial, ovarian, cervical, breast, lung, kidney, colorectal, and brain tumors. When expressed in normal tissue, folate receptors are restricted to the lungs, kidneys, placenta, and choroid plexus. In these tissues, the receptors are limited to the apical surface of polarized epithelia. The folate receptors in cancer appear to be associated with carcinomas, and usually aggressive types (lung, colorectal, kidney). Choroid plexus is another story. If the choroid plexus has folate receptors, the CP is also a site where there is production of transthyretin, which precedes the production by the liver by 2000 years. The TTR is also a protein that transports both thyroxine (once termed thyroxine-binding pre-albumin for the anodal migration due to tryptophan ahead of albumin (with 18 negative charges). This CCL complex also carries the very important carotenoid). The TTR is a direct reflection of the total body sulfur, and like Vit B9 (folate) and vit B12, is essential for methyl group transfer through the sulfhydryl. So any loss in lean body mass is reflected in loss of TTR, and this is what happens in cancer cachexia. It is not corrected by B9. What is the significance of the B9 receptor in choroid plexus. It must have a relationship to brain cancer – maybe not hemangioma, but glioblastoma (glial) I-IV. The only actual neural tumor that I can think of is neuroblastoma, which occurs in early childhood – 3-8 years. But the development of tumor of adult neural origin, I’m not aware of or have forgotten. The glial tissue is not neural, but mesehymal in origin. I believe that you need to post that on ResearchGate rather than as a comment to this article. Here no one will reply with substance to the research matters you raised. Not the right Forum and a comment to an article is not the right format.